Stocks are retesting February's lows, and there are signs the worst could be over from a technical standpoint. On Monday, the S&P 500 bounced sharply above its 200-day moving average, now at 2,586. But it will be key to see if the S&P 500 holds and closes above the 200-day, an indicator watched by technical analysts and non-technicians alike. If the 200-day holds it would be the second successful test of the February lows, a positive for stocks, but if it fails it will be "ugly," said Art Cashin, director of floor operations at UBS. The S&P 500 plunged to its 200-day moving average Friday, a level that traders were watching as a key level of support. On Monday, the market rebounded on easing trade-war fears and the S&P 500 bounced sharply above it, surging to 2,658, a 2.7 percent gain. But it will be key to see if the S&P 500 holds above the 200-day moving average, which is now at 2,586. The S&P, in afternoon trading, was up 1.9 percent. The 200-day is a widely watched indicator, used to follow price trends. It simply represents the average closing price over the past 200 trading days. "We're not making a call on what's going to happen over the coming days, but in general the uptrend is still intact based on that rising 200-day," said Ari Wald, technical analyst at Oppenheimer. "This is where you would expect to see a bounce. We need to see if trading action confirms it." Wald and others said it would take more than one session to confirm that the support level is holding. But Jeff Saut, chief investment strategist at Raymond James, said he thinks the sell off is over. The correction is over, "unless you get hit with some exogenous news," said Saut. He said fears of a trade war were over blown. Saut said he expects that stocks have formed a "W-shaped" bottom similar to the one in the last major correction in late 2015 and early 2016, where the market hit a low in September and then another in February 2016. 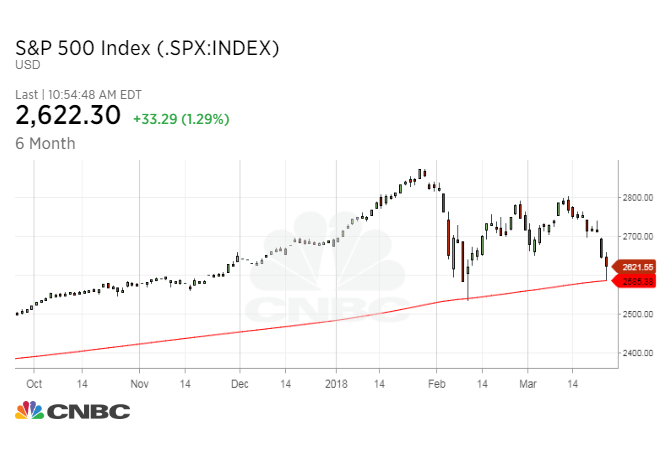 On Friday, the index hit the 200-day, then at 2,585, and closed just slightly above it, raising the tension level for traders who had to wait all weekend to see how the index would behave once it touched the average. This is the second time that the S&P 500 tested the 200-day in the sell-off that began in late January. The S&P 500 bounced off its 200-day moving average on Feb. 12, after hitting lows on Feb. 9. Art Cashin, the director of floor operations at UBS, cautioned not to underestimate the effect of holding at the 200-day moving average. "The big fear here is they stall and roll over. If they stall and roll over and go negative, that will be very ugly. ... If they remain above the 200-day, that will encourage more speculative buying," he said. According to Cashin, stock market lore says that when a security or index is below the 200-day moving average, returns are nowhere as good. Wald said the correction is on par with the average market sell-off, going back 80 years. He said the duration is typically eight weeks and the decline is an average 11 percent. On Friday, the Dow was 11.6 percent from its peak in January.